I am guilty of severe home envy. Whenever I go to someones elses home I can’t help but notice all the things I don’t have, but wish I did. 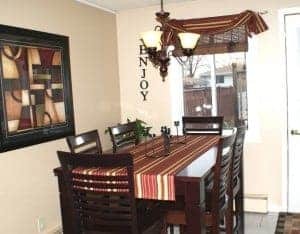 Perhaps it’s because I’m a stay-at-home Mom, so my home is my everyday all day, but I think eveyone gets a little home envy from time to time. We have lived in our small starter home for almost 5 years now and doing any more major updates just isn’t a financially smart move. We hope to move in the next few years and any additional money we spend on this house won’t give us any return on our investment when the time comes to sell. Also, add to that the fact that my husband and I both are cheap (him more then me), and you have a recipe for a “like it or lump it” home. Even though I can’t “update” my home this spring, I can give it an “uplift” with little time or money. I may have old/mismatched furniture and accessories collected over the years, but a little rearranging and decluttering can make even the most tired spaces look fresh. Add to that a few new and inexpensive accessories and you just might find yourself overlooking the imperfections of your home and focusing on what you do love. Yesterday I did just that. I sat in my livingroom and noticed the horrible mirrored closet doors I despise, my bubbling, badly laid laminate floors and my horribly done stuccoed wall and ceiling and thought to myself…I hate this room. I hate this house. I could do one of two things. I could decide I hate my home and just live with it until the time comes to move, or I could try to do whatever I could, without spending as lot, to make the best of a bad situation. Of course I decided on the latter. I cleaned and shined those repulsive closet doors, I mopped my honey coloured, bubbling floors and I uplifted my tired livingroom with a new lamp ($30) and two new throw pillows ($20). I also gave it a good spring cleaning. I hung two new pictures I already had and I got rid of a dying plant and made a new table runner and window valance from left over $3 a meter fabric! Total time? Under an hour and I spent only $50. My livingroom feels better now. Just making a few small changes uplifts it and gives it a fresh feeling, just in time for spring. Uplift your home this spring! Rearrange furniture, give it a good cleaning and purge some extra accessories and clutter! Maybe buy a new lamp or some brightly coloured throw pillows too! 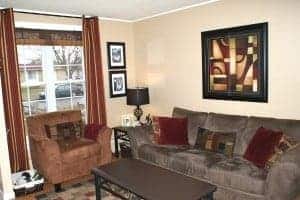 Hang some pictures or rerrange the ones you already have! You’ll be surprised what a big difference the smallest changes can make on the way you feel about your home. So, give your home a hug today! A little love from you can turn your home from drab to fab just in time for spring!